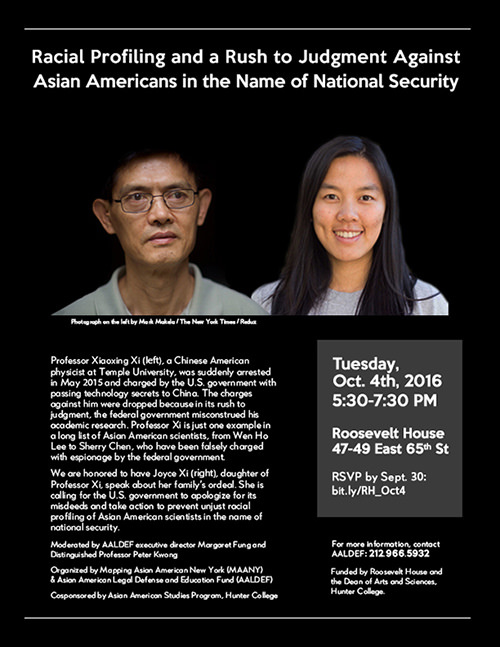 Joyce Xi, daughter of Temple University physics professor Xiaoxing Xi, will speak in New York City on Tuesday, October 4, 2016 about the targeting of Asian Americans in the name of national security and the wrongful economic espionage prosecutions of innocent Chinese American scientists, including her father. She is calling for a formal apology and urging the U.S. government to take action to prevent unjust racial profiling. RSVP by Sept. 30:bit.ly/RH_Oct4For more information, contact AALDEF at 212.966.5932.